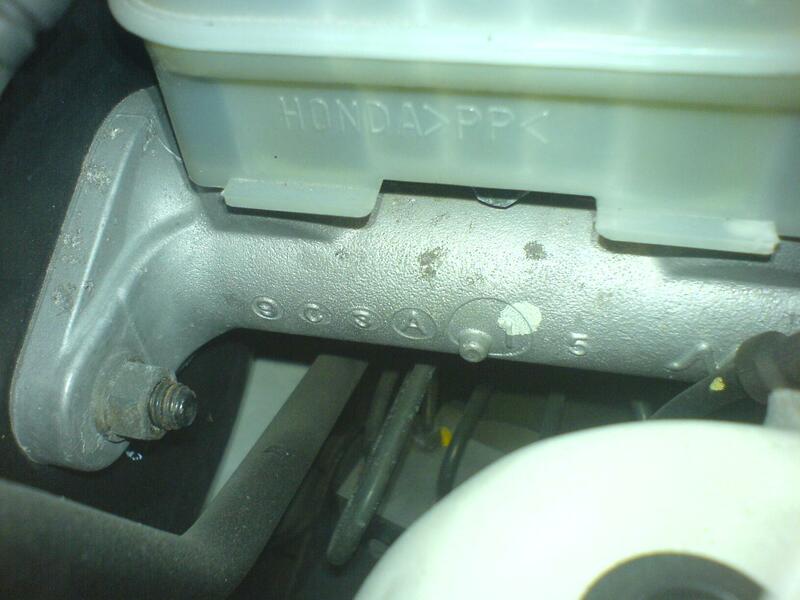 Hi, i just fitted a 282 upgrade onto my ek4 vti, i also fitted hel brake lines all around and blead the brakes properly. The problem i have is that the pedal doesnt feel as solid as it should with braided brake lines. Does anyone think this might be because i havnt fitted the 1" master cylinder yet ? I bought a mastercylinder off of a mb6 and was told it was 1", does anyone know how i can tell the difference between the 1" and my standerd one ? thats right get the 1" servo and cylinder fitted on and you'll feel it improvements if you look on the side of the brake cylinder tube there will be a number 1 etched on the side. Just to say you dont need the servo they are all the same for the ek chassis just found that out when i got a ek9 1" MC and servo for my ek4. EK9 on the left and EK4 on the right. (Picture borrowed off someone else) This is where the size number is, In the bigger circle. So far as I knew, the EK4 has a 7"+8" booster and the EK9 has an 8"+9"? It needs to be bigger otherwise the fluid pressures will be lower out of the bigger MC. Do not mix and match teh servo and master cylinders under any circumstances. I did and ive had to replace the discs and pads due to overheating. Basically the brake pressure did not ease off when i lifted my foot of the brake pedal and the pads stayed clapmed on the discs. Discs now warped and cracked and pads burnt to a crisp. Whatever master cylinder you use, make sure it has its original servo on it. You guys maybe right then. Only when i stood them next to each their the same size, Maybe the internal diameter is different. EK4 on the left and EK9 on the right. sorry to throw off the subject slightly but how do you tell the 1" MC from others made by Lucas? If you're going to do it all, you'll need the 260mm rears and an EK9 prop valve too! Glad you got it sorted, But as Kozy said upgrade the rears aswell. Also a question for Kozy can i run a ek4 prop valve with 282+260mm discs or do you need a ek9 one aswell as i always thought they where the same? You can run either, but if the valving is different (They have different part numbers which suggests this is the case) the EK9 unit will be better suited to that setup. regarding the master booster, it can be adjusted via the Kozy adjuster. Just use a vacuum relief valve after the check valve on the tube running from the intake manifold going to the master booster. this will help avoid what Weasel is referring to in his post in the topic. You can interchange the boosters, if you know what you are doing. I use the Kozy adjuster on my setup for mainly better pedal modulation/feel. Just to revive an old thread. Save starting a new. Struggling to find any info on this. I have an ej9 without abs and rear drum. Question, does anyone know if i need to upgrade the servo (brake booster) or if i new lines. Since I don't have abs and using parts what originally had abs makes things complicated. Actually having no ABS makes it simpler I'd say. I don't know about booster but I'd say your prop valve won't work correctly with the setup. I'd try to find rear brakes to match the fronts. I also believe 1'' MC is too big for ek4 brakes.